Purposely positioned on the east and west sides of the iconic Palm Jumeirah’s trunk, this 522-berth marina held the record in 2007 as the biggest budget marina in the world. It accommodates yachts of 10 to 30 m in length and the berths are evenly divided, with 261 in each basin. Marinetek’s extra wide and stable concrete pontoons provide an extraordinary level of comfort for marina guests and set a new standard for marinas in the UAE. Berths at Palm Jumeirah are of generous width to suit modern yachts and finger piers provide convenient alongside access with high tech utilities, discrete LED illumination, underwater lighting and designer fixtures and fittings. 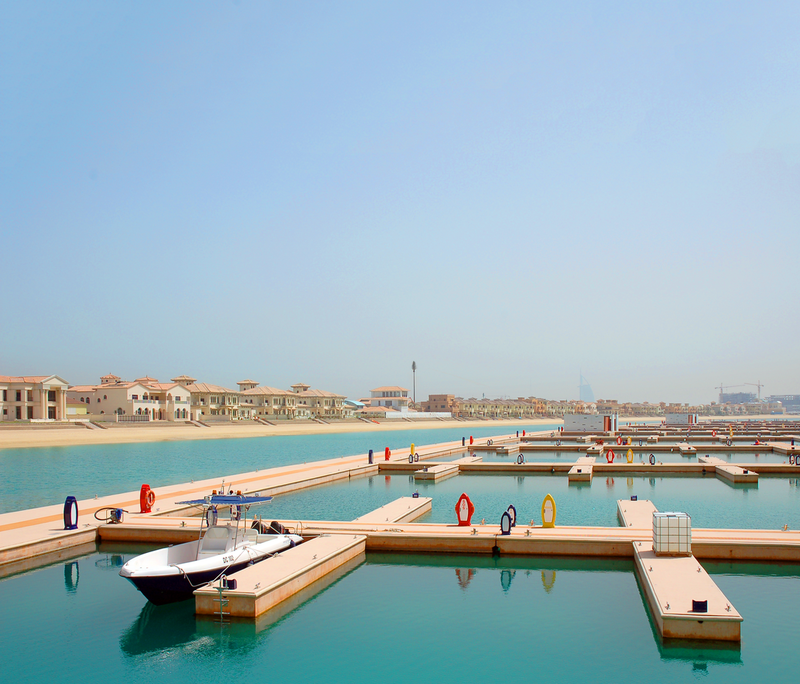 Each basin benefits from two fully equipped floating utility buildings. The marina is managed by Nakheel Marine and, as part of The Palm, has become one of the world’s most recognisable landmarks. 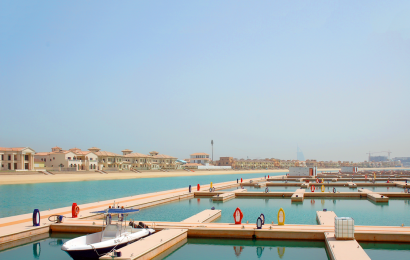 Capacity of the marina: 522 berths for 10-30 m yachts. Products: Super Yacht and Heavy Duty Pontoons, Super Yacht Fingers. Customer: Nakheel, Dubai/Island Global Yachting. Delivered by: Marinetek MEA with Target Marine, UAE. decks, Seaflex mooring, Rolec power pedestals, curved main spines. The Palm Jumeirah Marinas have been built to the highest standards and pontoons feature stainless steel reinforcement and plastic coating. The pontoons are moored by no. 330 Seaflex units, secured to concrete anchor blocks on the seabed.